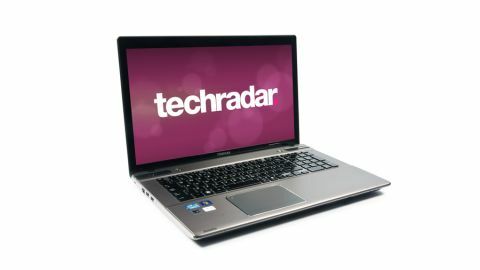 The Toshiba Satellite P875-102 signals the arrival of third generation Intel Core power at the company and we have to admit that it's off to a flying start. Not only is this laptop an incredibly powerful and slick 17-incher, it also looks good and comes with a price-tag that represents great value for money. The P875 is a bulky beast, but it's a looker too. Featuring a sleek silver embossed chassis with a silver trim, along with a spacious isolated keyboard (complete with full numeric keypad and backlighting), it may not have the sophistication of the Ultrabook clan, but it looks and feels reassuringly solid. A slight downside to the P875 is the trackpad. The integrated buttons are quite unresponsive and we had trouble making it recognise a right-click on more than one occasion. There's also a heat issue. Despite running almost silently, the P875 throws a lot of hot air out of the ventilation grill. Powered by a quad-core i7 processor running at 2.3GHz and backed up by a healthy 16GB of RAM and Nvidia graphics, the P875 scored highly in our lab tests, as well as performing with aplomb in our real-life scenarios. Picture editing was a speedy-affair, HD video played back without stutter, and we were even able to run Batman around Arkham City at around 60fps without any bother. The sound quality is also fantastic, with the machine packing four speakers, SRS Premium Sound 3D software and Slip Stream technology. You can make use of the Harman/kardon speakers with the laptop in sleep mode - even when not plugged in - using Toshiba's 'Sleep-and-Music' function. You'll be able to store plenty of high-definition media action thanks to the 750GB HDD and there's a Blu-ray player on board too. The 17.3-inch display sports a 1,600 x 900 display, so not quite Full 1080p HD, but not too far off. Viewing angles aren't brilliant however and there's a slight brightness issue, especially when watching poorly lit action. Around the sides you'll find plenty of connectivity going on with four speedy USB 3.0 ports, an Ethernet port, and video out options courtesy of both HDMI and VGA. The USB ports also boast 'Sleep-and-Charge' tech so you can power up your gadgets without even turning the P875 on. Battery life on this powerful notebook is poor, and it survived just over two hours in our stress test. However, it's not a portability-friendly machine anyway so we're not sure how much that matters. The Toshiba Satellite P875-102 snuck in almost unnoticed but is likely to make a pretty big impression. It's a fantastic media-based PC, with only a few minor shortcomings, that also holds up quite well as a gaming machine. It may not have the raw game performance of the Alienware M17x or the MSI GT70, but at a few hundred quid cheaper, it's a much more wallet-friendly option.